If you wanna chill tonight, Denver_Max’s room is the one for you. This adorable blue haired mermaid will have you relaxing and letting your mind run wild while her sheer beauty makes short work of your libido and makes you so horny you could never forget about her beautiful face, no matter how much time passes. Denver_Max is wearing her yellow onesie which makes her look even more adorable and so, so comfy! The atmosphere in Denver_Max’s room is contagious – the chillness is spreading and so is the love emanating from her room. 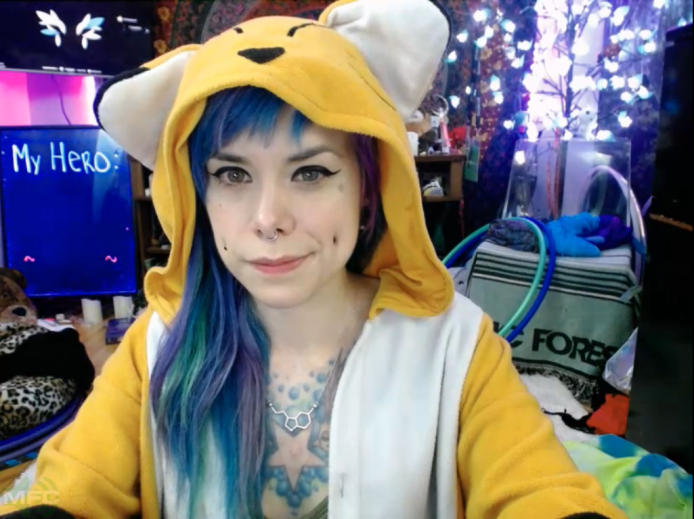 This beautiful babe is covered in all sorts of ink which you will get to see when she takes off her onesie in about 600 tokens, so join in and help clear that count! Previous PostSeduction Is Inevitable With The Magic Of AriDee Next PostCubbixoxo Has An Amazing Pair Of Pumpkins.